If you don’t have religion you may find it in Zion. Whatever you believe, Zion offers proof that there is a larger spirit at work. It doesn’t matter if there is single grand architect or gods and goddesses who built a fortress of sanctuary, but the sheer cliff faces and green vegetation will take your breath away. The road to Zion twists and turns through the highland before the descent into the canyon. 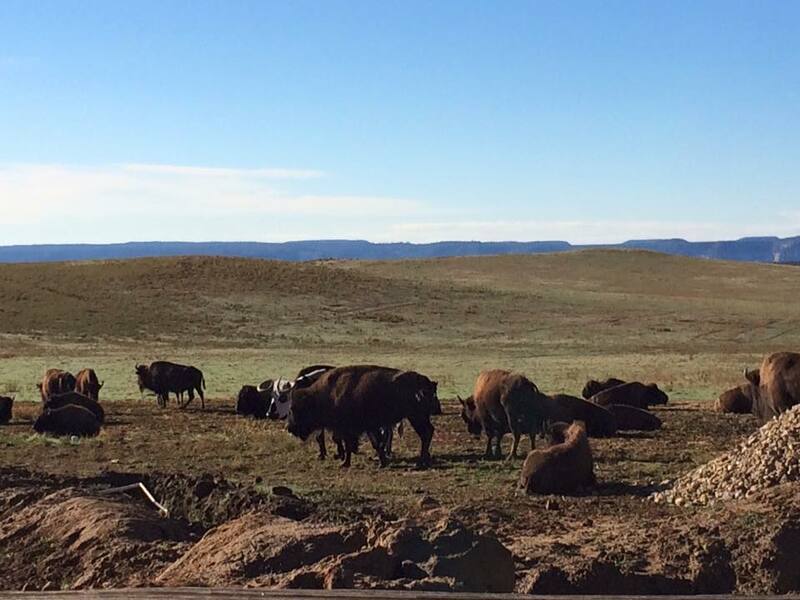 The last thing you see before you enter into the National Park is a farm which happens to be raising buffalo. I don’t know about you, but there is something about a buffalo that takes me back in time. They always remind me of the old west and thanks to Lieutenant John Dunbar I can only refer to them as Tatonka. After you enter the park, my companions and I quickly became distracted by the change from prairie to mountain scape as we were greeted by Checker Board Mesa. The rock scape swooped and swirled with red, white and brown in the fashion of a twisted ice cream cone. It was preparing us for the best scene of all. The heart of the national park lies just beyond a dark 1.1 mile tunnel straight through the cliff side. It works as an interesting sensory deprivation; when you reach the other side everything pops from the light hitting the cliffs to the shadows that the arches cast. 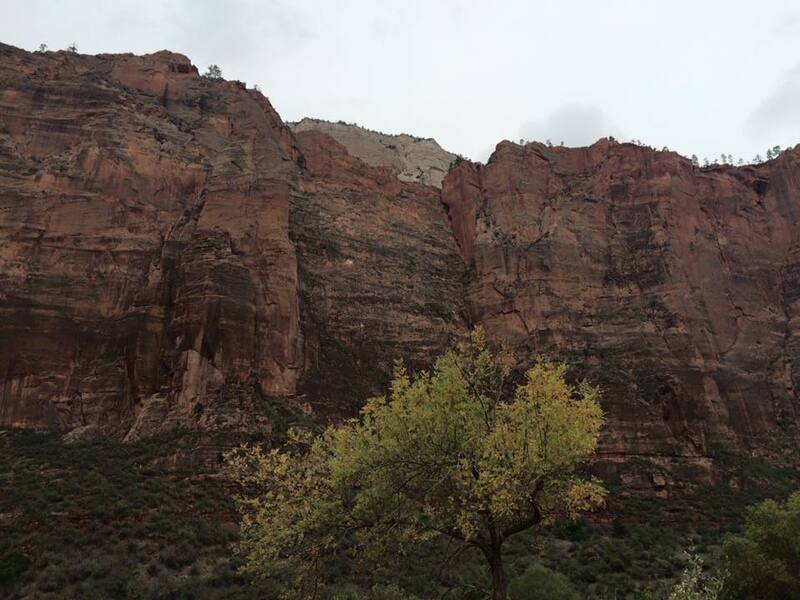 We arrived in Zion Monday afternoon in a thunder and lightning monsoon that lasted through the night. Excellent for tent camping eh? Being confined to the tent could have been terrible, but luckily we had card games and a fun-flask. The next morning brought fair weather so we packed up and headed out to find a spot in the South Campground. We were in luck following our restless night we were rewarded with the best campsite – #77 with a fantastic view of the cliffs. Temple of Sinawava – This is the gateway to the Narrows which are popular slot canyons. There is a riverside walk and access to the Virgin River. 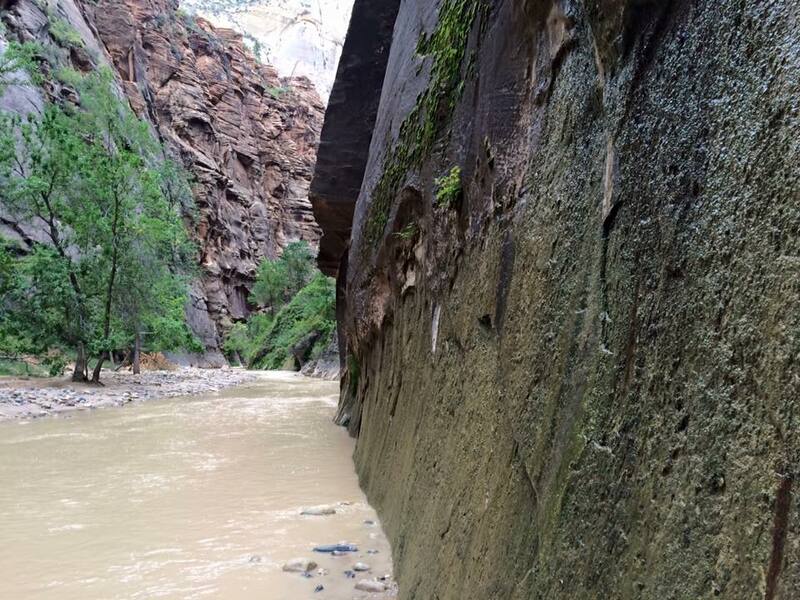 The Virgin River is responsible for creating Zion Canyon. Big Bend – Views of the Great White Throne and the Angel’s Landing Bridge. This stop has no access to trails but has great angles for taking pictures. Weeping Rock – This stop has access to the weeping rock trail which features hanging gardens. The view from weeping rock. 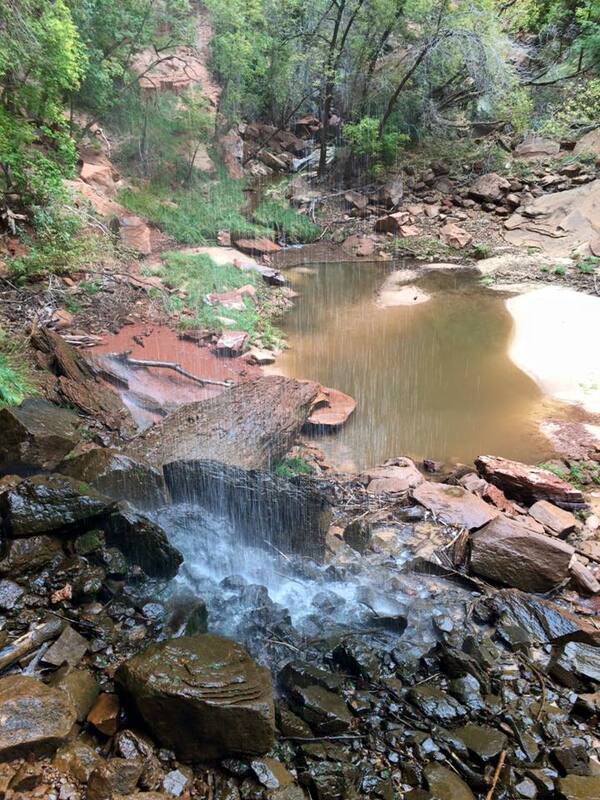 The Grotto – This is the entrance to Angel’s Landing and other trails. 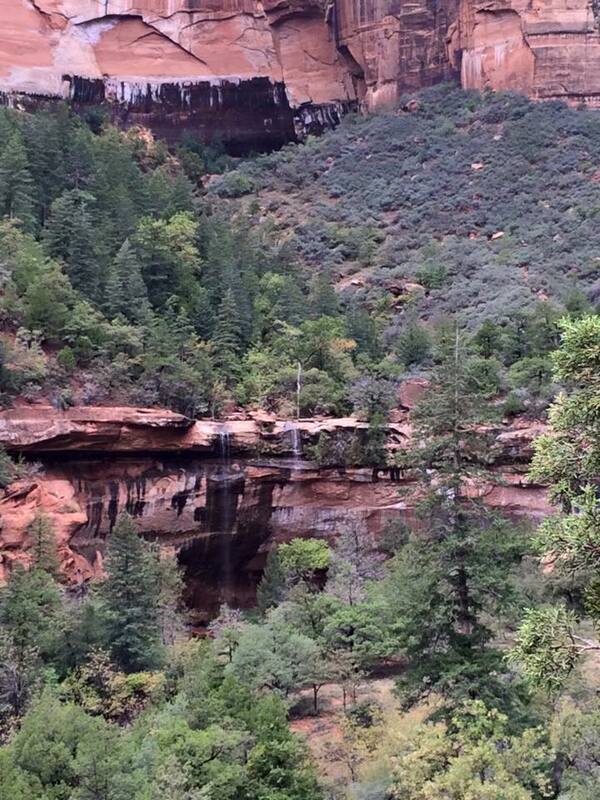 We took the Kayenta Trail to the emerald pools and then to the Lodge where we got lunch. Court of the Patriarchs – The three largest peaks in the park named for the three Biblical fathers – Abraham, Isaac and Jacob. Also can be seen is the Sentinel and Mount Moroni. Touring the park took roughly 6-8 hours. We took our time and enjoyed the day. The park is goliath and I am sure you could spend a week there and only see a small percent of what it has to offer, but with our time constraints and weather restrictions we saw a lot of what the park has to offer. My best advice: If you plan on camping get there early! It would seem that the ideal time is around 7am-9am – any later and you risk not getting a spot in the park. 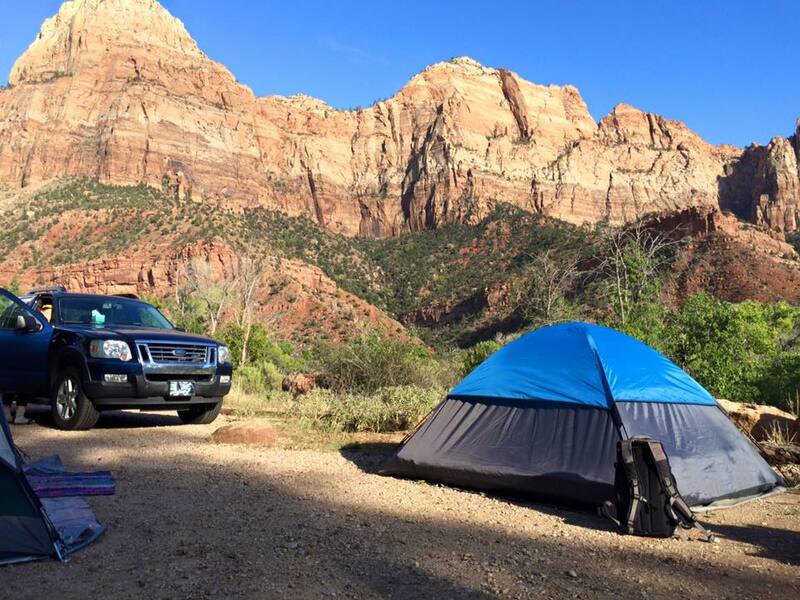 There are three campsites: The Watchman campground which is for reservations only, south campground (where we stayed) which are first come, first serve, and Lava Point which is a primitive campsite and closes in October. Fear not, if there is no camping available in the park there are several other locations that would be happy to accommodate. The first night we arrived later than we liked but stayed at Zion River Resort in Virgin, UT. My issues with Zion: the park was terribly overcrowded. Even in the off season my three companions and I had to squeeze into a shuttle to each location. As we hiked to each location of the shuttle stops we felt rather like cattle. Instead of enjoying the scenery and spectacular views – I was too busy dodging slow walkers or being caught up in a sea of fellow sight seers. In the parks defense several of the harder hikes were closed due to the un-seasonal monsoons from the previous nights. We would have attempted Angel’s Landing had the trail not been closed. The crowding however, could never ruin the experience – the scenery was incredible. I can’t wait to return to the canyon and explore all of the areas that were closed and hopefully obtain permits to enter the protected sections. Would love to explore Zion. And hope to do it next year when I visit America. This is beautiful! Zion looks awesome – been on my list for way too long. Good to know about the crowds though! I didn’t realize it was that even off season was that busy. I’ll definitely be keeping that in mind for a future trip. Your photos are beautiful. Thanks for sharing your been-there tips. I would love to visit Zion soon, US trip for 2018 I hope! I really can’t wait to get out and do some hiking in Utah. Zion is just incredible and you’ve done a great job presenting a side I’ve never seen before. It makes me really want to go …now! Great job and thanks for sharing! Zion is such a great park in utah! I would love to go back as an adult and hike Angel’s Landing! This is a great post! I had never heard about Zion before this post and for sure it looks amazing. I like the tips you mentioned about being overcrowded and the timings. They will be really helpful to the ones planning their trip. Thanks for sharing. Zion looks magical. The natural beauty and the landscapes seem to have an aura of mysticism abut them, no wonder this borders on the spiritual. Have always been fascinated by the wild beauty of the Utah region, and the Zion park is full of this.